Credited art that has been given to you is fine, though we do always like to see your own work! Also, complete pages are given extremely high preference over pages that are still in progress. Primarily, the most important thing is to try to make your page as visually attractive as possible and avoid inappropriate scenes in stories. If it wouldn't get into The Neopian Times, then it probably won't get spotlighted, either. 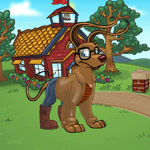 Additionally, please make sure your character is a Neopet and that the story takes place in Neopia. We see lots of cute pages that we can't spotlight because, even if the imagery is of a Draik-like dragon, if he lives on the planet of Tra-la-la then we don't consider it Neopets-themed. That said, you can make up your own subzones (like, say, "Draik Hollow" in the Haunted Woods). Neomail is monitored by our system and will alert us to investigate if inappropriate things are happening there. (Please note that investigations are done by real people; the automated system only notifies us of possible issues.) We will also look at Neomails to investigate scamming or other reports. If neither of these are the case, then your Neomails are not being read by anyone except the people to whom you sent them. Did you really think that, just because you started off with a clever little pun, we'd put your question in the Editorial? How well you know us! We have sent your request to our Content Department. Commissions are not allowed, as you can't make money (real or virtual) in exchange for services on Neopets. Art trades are fine, but are unsupported if one side ends up not delivering. that I draw Kanrik fan art, okay?" If an account or Neopet is reported, then we will investigate based on the evidence on the account, not hearsay. If nothing strikes us as suspicious, then nothing with happen to the account or Neopet. We feel odd that we even need to state this, but we do not target UCs. Players target them, and if they are up to shenanigans such as buying or selling the Neopets, then that is what results in the UCs being frozen. We've looked into it, and the Potion of Strategic Maneuvers should now be working correctly. Neopet trading was originally against the rules. Years ago there was a policy change made to allow it in response to player request. Not at all! Well, as long as there's nothing shady going on. We can't imagine how it would be used in such a fashion, but you guys never cease to surprise us. We understand that the bracket system is the in thing to hate on, but we got just as many complains about the Round Robin system, which is why it was changed in the first place. We plan to revisit AC when the time comes next year and either redo the format if we can find a good format that addresses your concerns (Round Robin doesn't solve some of the bigger issues we've heard from you guys, either) or say goodbye and do something else. Absolutely not. The player name isn't listed for a reason. Such great literature must not be lost to the ages!